Heat oven to 400°F. Lightly spray large cookie sheet with cooking spray, or drizzle with olive oil. 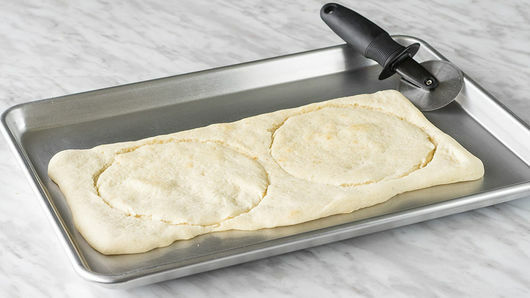 Open and press 1 can (13.8 oz) Pillsbury™ refrigerated classic pizza crust dough to thin layer on cookie sheet. Bake 8 minutes; cool. Meanwhile, measure diameter of tall-sided ovenproof pan. (Pan used was 6-inch in diameter with 4-inch high side.) 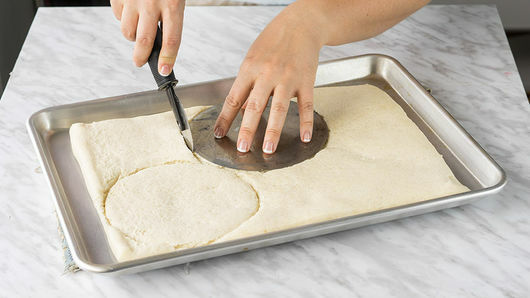 Cut out three circles from partially baked crust that are diameter of pan. Set aside. Open another can of pizza dough, and press out onto lightly greased surface. Cut a long strip of pizza dough, at least 1/2 inch wider than height of pan (in this case, 4 1/2 inches tall). 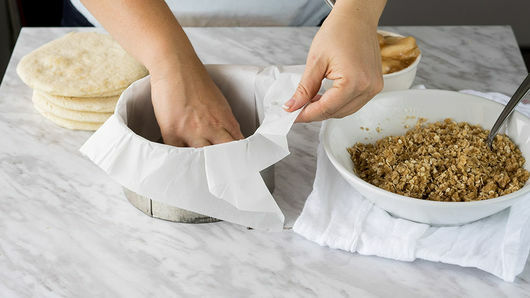 Place strip of dough on piece of cooking parchment paper; cover lightly with damp towel, and set aside. Press remaining strip of dough onto another lightly sprayed cookie sheet. Bake 8 minutes. Cut out two circles from partially baked crust that are diameter of pan. 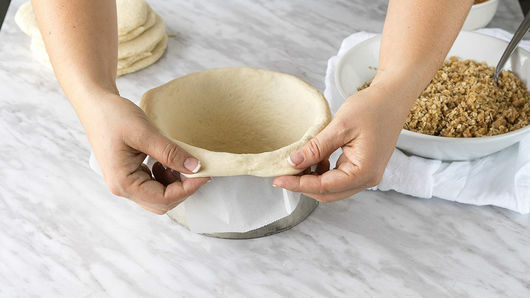 Line pan with cooking parchment paper, so ends of paper stick up and out of pan. Carefully drape long strip of pizza dough around inside edge of pan to line it, leaving 1/2 inch hanging over outside edge, and bottom open. Pinch seams closed. Place one of the partially baked pizza dough circles in bottom of pan to fill bottom. 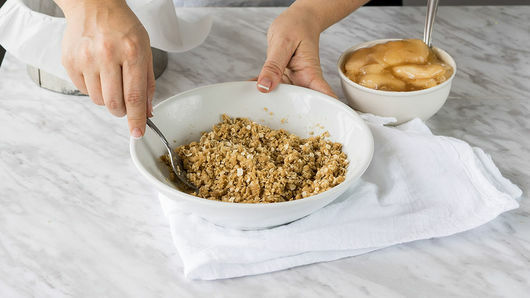 In medium bowl, mix 4 tablespoons melted butter, 1/2 cup packed brown sugar, 1/4 cup all-purpose flour and 3/4 cup quick-cooking oats until combined. 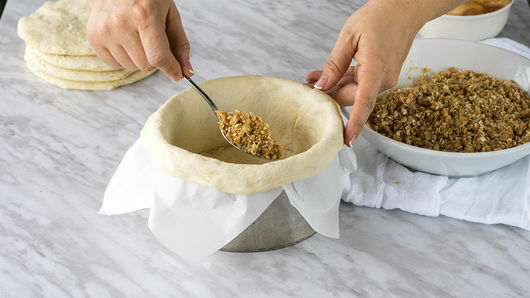 Spread one-third of the oat mixture on bottom layer of pizza cake; top with another pizza dough circle. Spread half of 1 can (21 oz) apple pie filling in even layer; top with another pizza dough circle. Repeat layering, so you finish with oat mixture on top. 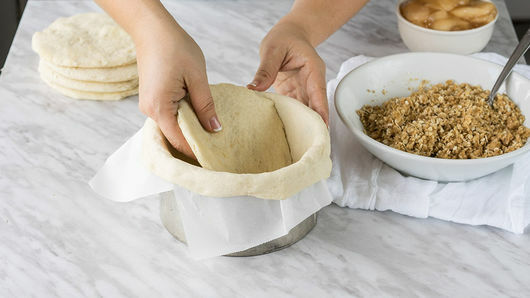 Fold overhanging dough up and over edge of pizza cake to create raised crust. 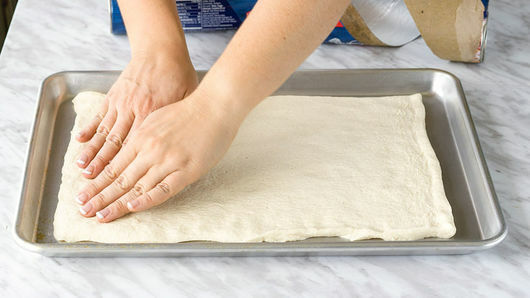 Bake 20 to 25 minutes or until dough around pizza is fully cooked. 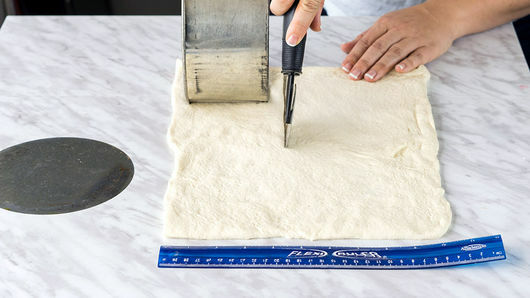 To test, carefully pull up on parchment paper to raise pizza out of pan. Once fully cooked, cool 20 to 30 minutes in the pan before removing. 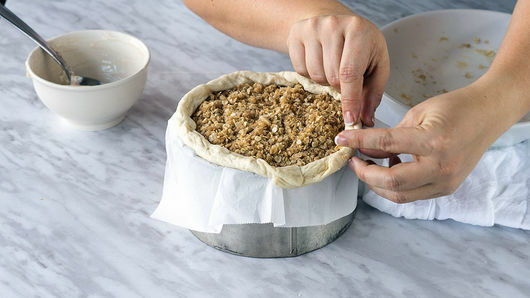 Use sharp knife to cut slices like you would a cake. Drizzle with a simple vanilla glaze if desired: In small bowl, beat 1 tablespoon milk, 3/4 cup powdered sugar and 1/2 teaspoon vanilla with whisk. 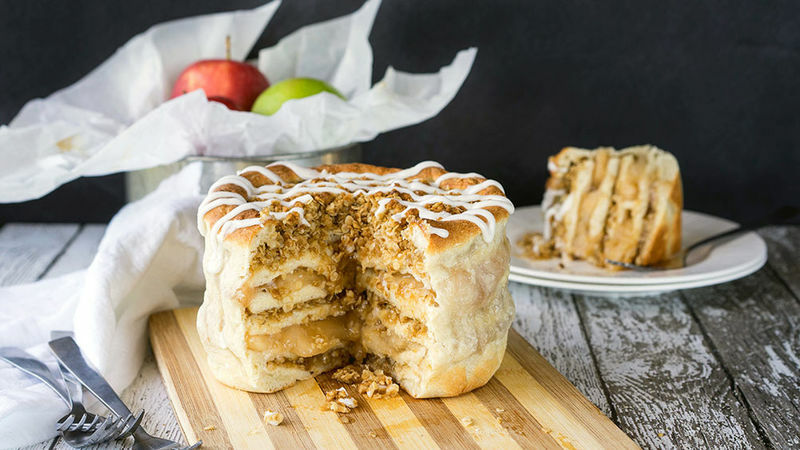 Drizzle over cooled apple pie pizza cake. 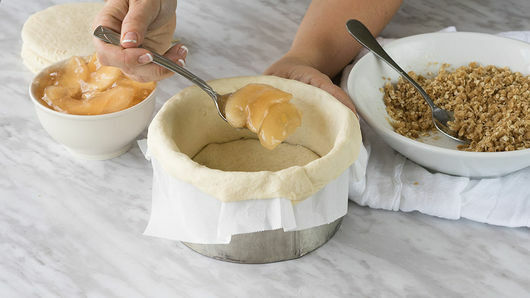 Switch up the flavors by using any type of canned or homemade pie filling of your choice.